Beautiful newly built villa near Porec. The house consists of two residential units. The main living unit has the entrance on the ground floor and consists of kitchen, dining area and living room, another smaller living room that can serve as an additional bedroom, a bedroom on the ground floor, a bathroom on the ground floor and a guest toilet on the ground floor, located on the first floor is another bedroom with its own bathroom. The second unit is a small apartment, which can be accessed via a large terrace on the first floor. The apartment consists of a kitchen and a living room, a bedroom and a bathroom. The house has a large summer kitchen, swimming pool and orchard. It is equipped with central heating / cooling via a heat pump as well as with video surveillance, alarm system and pool heating. The house is sold fully furnished. 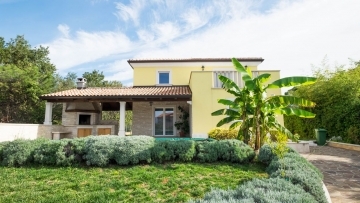 The house has excellent rental income, which amounts annually to 30-35,000 euros gross.